The Fantasy of Lights Parade is well named as an extravaganza of glitter and fun, with usually over 100 floats and festive vehicles, multiple marching bands, horses, performers, military contingents, giant helium balloon characters – and this year the one and only real Santa Claus himself, down from the North Pole, is attending too! This year the Grand Marshal is Myron Mixon, barbecue champion, TV star, bestselling cookbook author and all-round “Winningest Man in Barbecue”. The presenter of the parade is Ole Red Gatlinburg, an exciting newcomer to Gatlinburg planning to open its new Parkway establishment early in 2019. The parade participants will gather from 5 or 6 pm on, along Baskins Creek Bypass just off of East Parkway. The lineup begins its procession at 7:30, entering the main Parkway strip at Light #3 and progressing south through downtown to Light #10. It lasts about one hour, and the leaders should reach Light #10 around 8 pm. Parking is available at the two city lots at Ripley’s Aquarium (Light #5) and at Light #3. There are other free and paid parking spots all around. “Come early” is always the best advice for this kind of crowd-drawing event. 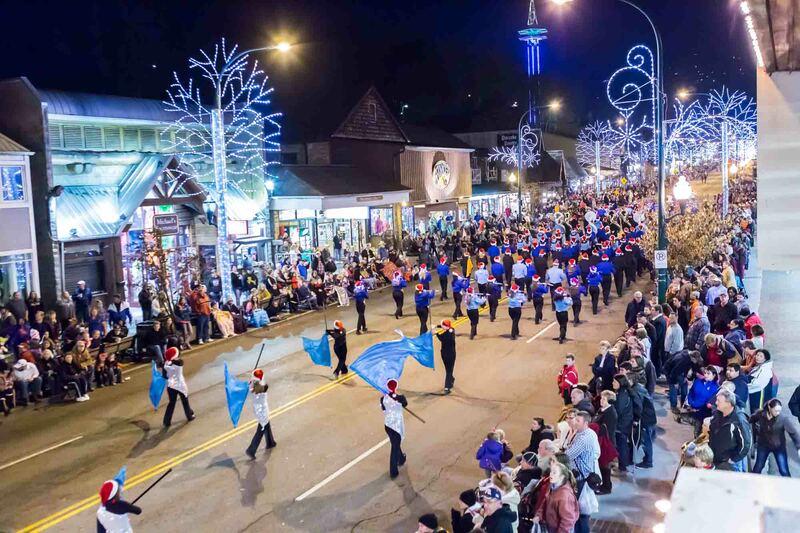 Gatlinburg is already aglow with its millions of lights for the season, and the Parade adds a fun time and blaze of more dazzle for those people – that’s all of us – who can’t get enough of it.